1. 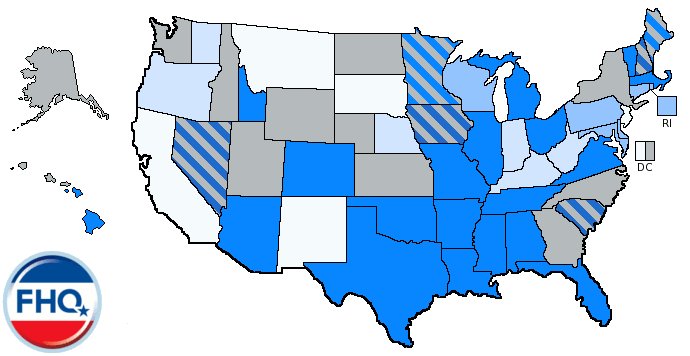 For all the talk of frontloading around here, there have been but two states that have (actively) moved earlier on the 2016 presidential primary calendar: neighbors, Arkansas and Louisiana. The Natural state presidential primary shifted up 12 weeks from late May to the first Tuesday in March this past week. Just south in the Pelican state, the presidential primary was bumped up two weeks in 2014. There are two additional states -- New York and Texas -- that had later primary dates in 2012 than each currently does on the 2016 calendar. 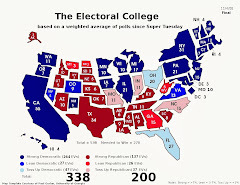 The New York move from February to April in 2011 expired at the end of 2012, returning the presidential primary in the Empire state to February. In Texas, the 2012 redistricting court battle forced the primary back to the end of May. But the Lone Star state primary reverted to the first Tuesday in March date called for in state law for 2016 (with redistricting settled). 2. Alabama is very likely to join that group and a handful of other southern states on March 1; the date of the proposed SEC primary. 3. Most states that have moved or are in the process of potentially moving are shifting back to later dates on the calendar. The vast majority of that movement has been cleaning up the the February remainders that were left during and after 2012. 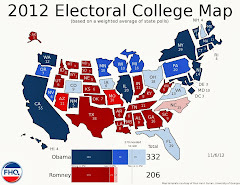 That group includes the 2012 rogue states, Arizona, Florida and Michigan, as well as a handful of non-binding caucus/primary states, Minnesota and Missouri.1 All of those states now have positions on the 2016 calendar in March. 4. The month of March has gotten it from the other end as well. The Texas reversion, the Arkansas move, and likely the North Carolina move together mean that three states will hold primaries and around 250 [Republican] delegates will be allocated in March rather than May. Similarly, those February-then-March-now states mentioned above translate to approximately 300 delegates being allocated in March 2016 rather than February 2012. If you want to quantify the calendar compression that the Republican National Committee wanted/wants for the 2016 cycle, then the shift of those 550 delegates from earlier and later points on the 2012 calendar captures it well. More candidates running or likely running for the Republican presidential nomination means a larger potential total population of visits. This is a minor point, but a part of the story nonetheless. Certainty/uncertainty 2016: Fast forward to 2015-16 and the positioning of the candidates is if not less clear, then it is more jumbled relative to 2012. But the calendar? The primary calendar is as clear as an unmuddied lake compared to the 2012 calendar at this same point in 2011. That has a significant impact on campaign decision-making. If a candidate or his/her campaign is aware of the likely shape of the primary calendar, they can more efficiently if not effectively allocate their resources (campaign spending and candidate visits). A crowded field and calendar certainty leads to candidates attempting to carve out some niche -- some state -- where they can claim victory and stay alive. But again, this is activity in 2015. 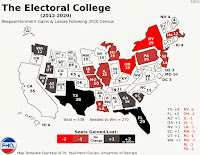 Once the calendar (year) switches from 2015 to 2016 and especially once votes are cast in those carve-out states, the winnowing of the field will hit or already have hit overdrive. That does not make travel to later states unnecessary or wishful thinking on the part of candidates and their campaigns. Rather it is more properly viewed as insurance should a candidate claim one of the two or three viable slots heading into March (or deeper into March). 6. FHQ will propose a hypothesis: As calendar year 2016 (or perhaps the Iowa caucus) approaches, visits to non-carve-out states will decrease. Certainty -- with both the calendar and candidate positioning -- will increase and the campaigns will focus more and more on those earliest states. That is not to suggest the focus will exclusively be on those first four states, but it will shift toward them. 7. Interestingly, there seems to be a cut-off on the calendar: March 15. That seems to be a line of demarcation. Yes, that is the point on the calendar where the proportionality window closes, but candidates and their campaigns are not spending much time if any in states with contests after March 15. That is telling. First, it means that there is a limit to just how forward thinking the campaigns are willing to be. Secondly, however, that is a bit of an indirect indication that that is a point on the calendar where the candidates and their campaign braintrusts are hedging their bets and assuming the race will be concluded (or that the presumptive winner of the nomination will have emerged). The process is not there yet, but the 2016 presidential primary calendar is a lot further along in 2015 than it was in 2011. 1 Though Missouri held a February presidential primary in 2012, the Missouri Republican Party chose to tether its delegate selection/allocation to a rules-compliant caucus/convention system that began in mid-March. 2 The Florida primary actually preceded the Nevada Republican caucuses in 2012.